There is a large grommet in the back of the box channel where the master cylinder lives and where the rear brake pipe goes through the grommet to the rear brakes. It’s a large thick beefy looking grommet that does a good keeping out water and dirt/salt getting into the channel. The grommet size is about 32mm dia. and the hole size is about 20mm (chassis hole) and brake pipe size hole in the centre. It looks like it was made for the job. The Bull Motif Spare part CBS116 is not the same type of grommet. Does any one know where I can buy one please. Similar, but I have a stack of electrical grommets, 20mm is about the size on the back boxes for sockets and switches. Depending on what you are doing you can put a hole in a solid blanking grommet, or for places like the solid pipe at the front going through the tie plates cut a normal grommet so it can be used in the smaller hole. Yes I have considered a blanking grommet with a sealer. Thank you for your suggestions. On another subject, this is about bubble flare and double flare brake pipes. The off side rear pipe is steel and uses double flares (probably original) while the rest in copper use bubble flare. Any idea please. Check carefully, there are some double flares, but I cannot remember of the top of my head where they go. As Woody said most hard fittings are just concave base so take the bubble, but if you look in and see a cone shape towards you it needs the double flare. Check them all but in particular the banjo fittings to the rear wheel cylinders, the one on the rear of the master cylinder. It is a while since I have made any, but there are definitely some that are different ends on the same pipe. It is further complicated as quite a few of us are running different brakes so have non standard pipes anyway. This is the difference when you look in. Last two show the pipe flares. and the wheels to brake union pipes have double flare. So check what it’s going into is the answer. Many thanks for your input. Checking the female end is always the best practice. 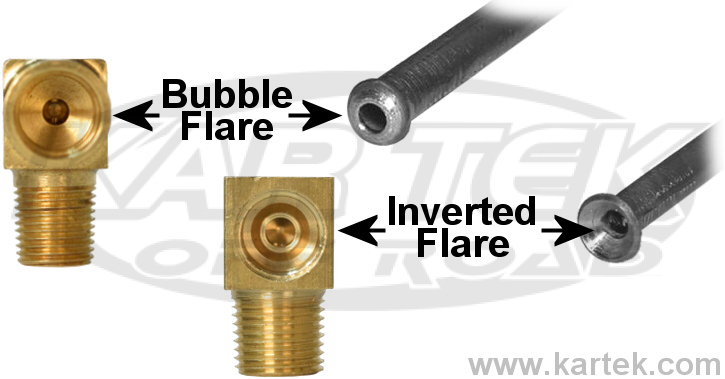 The double flare is associated with UNF fittings and the bubble is with BSF fittings. All fittings should be bubble except the bridge pipe for the front wheel cylinders. The T on the rear axle may be the one exception. From early 1000 production the T is UNF going in and BSF going out. I can't recall if the incoming hard line is bubble or double flare. A quick visual would confirm. Of course anything could have been changed over the years. Thanks for that. Having made bubble flares for the front T, I have taken them off and will convert to double and will take the back T off to check. The good thing is you can convert to double flare from bubble but not the other way round. The master cylinder banjo should be bubble because it’s BSF.